M4C Because Jehovah Shalom, I am Like a BEAR | GOD Who Are You? AND Who Am I? In this life I’m a woman. In my next life, I’d like to come back as a bear. When you’re a bear, you get to hibernate. You do nothing but sleep for six months. I could deal with that. Before you hibernate, you’re supposed to eat yourself stupid. I could deal with that, too. When you’re a girl bear, you birth your children (who are the size of walnuts) while you’re sleeping and wake to partially grown, cute, cuddly cubs. I could definitely deal with that. If you’re a mama bear, everyone knows you mean business. You swat anyone who bothers your cubs. If your cubs get out of line, you swat them, too. I could deal with that. If you’re a bear, your mate expects you to wake up growling. He expects you to have hairy legs and excess body fat. Yup, gonna be a bear! Reincarnation is not substantiated in the Bible, but this email forward is priceless. We don’t have to wish to “come back as a bear” to be like one. We already are. We are creatures of habit, just like bears. And, like bears, those habits may mean life or death. In the wild, brown-bear mothers in Alaska do not give the fish they catch to their cubs. They teach them how to feed themselves for their own survival. 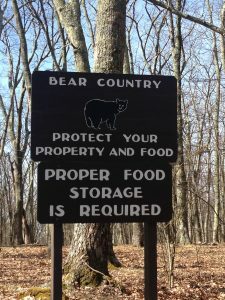 Like humans, though, most bears prefer what is readily available. They know what ice chests usually contain, and can smell food even if it’s wrapped in plastic and locked in a car. They can tear the window out of a car door or rip open a locked trunk to get what they want. But, going to this unnatural means to get what they want may cost them their life when surprised campers or protective park rangers shoot them. Just like campground bears, we Christians can become dependent upon easy meals, being spoon-fed by others, if we don’t learn early in our walk with the Lord to go to our natural source of supply–God’s Word. This chapter will serve to give a taste of what Jehovah-Shalom can do in our lives such as bringing peace out of turmoil and working miracles when we need one. True fulfillment will come only as we seek our natural source of nourishment: eternal, living water and bread of life which is God’s Word. For us, this can mean spiritual life or death. What promises: wisdom, knowledge, understanding, victory and protection for the faithful ones! Digging for treasure in God’s Word always brings a reward. When we create this habit of seeking nourishment from The Source, Jehovah-Shalom teaches us the “B-E-A-R” Facts of Faith: B-elieving the Word, E-xpecting from the Word, A-sking from the Word and R-eceiving from the Word. “And without faith it is impossible to please God, because anyone who comes to him must believe that he exists and that he rewards those who earnestly seek him” (Heb. 11:6). Faith is like a two-sided coin, with fear on the other side. Gideon feared, but at the word of the Lord, he reversed the coin and put his faith in God who brought the victory. Like Gideon we, too, can flip our coin when fear enters our heart. We do that by applying knowledge of these four principles of faith that work together. Hosea 4:6 says, “My people are destroyed for a lack of knowledge.” We will examine these four treasures from God’s word after we understand how faith works. Faith is displayed in our lives through our actions and by our words working in conjunction with God’s Word. After all, it was Joshua who was told by God that if he would meditate in His Word and not let it “depart from your mouth,” (Joshua 1:8) observing to do everything in it, he would be prosperous and successful. Words “from our mouth” matter. Pat Boone’s daughter, Lindy Michaelis, had been digging in her natural source for food-her Bible. One day, her twenty-six year old son, Ryan Corbin, fell forty feet to the concrete floor through an unmarked roof opening of his apartment building in 2001. Ryan was not breathing when paramedics arrived. For six months, Ryan was in a coma on maximum ventilator support with brain injury, and he was unresponsive to outside stimuli.4 Lindy spoke formative, positive words, along with Scripture, day after day over Ryan’s lifeless body. After four years of prayer by people all over the world, and constant “Mama Bear” mothering, Ryan is now in a wheelchair; he can move his legs, and he can recite memorized Scripture. Lindy attributes Ryan’s recovery to the creative spoken word over him, for “Death and life are in the power of the tongue . . .” (Prov. 18:21 Amplified). Why are words so important? In looking at the power of the creative spoken word, it helps to see words as substance, capsules of energy transported from one place to another. This is what a radio does: transports words. Webster’s dictionary defines a radio as “wireless transmission and reception of electric impulses or signals by means of electromagnetic waves into which sound is converted.”5 When God spoke the words, “Let there be light,”6 He created the environment for energy that would later be used to transmit words. The first chapter of Genesis says that in the beginning, the Spirit of God hovered in the formless, empty darkness. Then something changed. He spoke. Nothing happened until He spoke. Because He spoke creative words, the heavens and earth came into being. Nine times, He spoke them, and then Scripture says, “And it was so.” Light was created first, and without this radiant energy traveling at 186,281 miles per second, carrying God’s next words, nothing else could be created. Have we become aware of the awesomeness of this yet? No wonder Jesus said, “But I tell you that men will have to give account on the Day of Judgment for every careless word they have spoken” (Matt. 12:36). Lindy Michaelis knew she was created in the image of God. She knew she had creative word power. With this awesome ability to influence and create comes great responsibility. God has given us the responsibility of wisely directing our words. We are seated in the body of Christ–at the right hand of the Father in heavenly places. Jesus gave us the keys to the kingdom of heaven (see Matt. 16:19); those keys are “how we use words.” We must take this very seriously. Our words are capsules of creative or destructive energy. They are not vapor that dissipates into thin air, never to be seen again. We see their results in our spouse, our children and our friends. They are matter; they are transmitted and felt. The following “B-E-A-R Facts of Faith” and corresponding principles give us a guide in how to wisely command and control our words. Keep in mind they are the bare facts of faith, not necessarily the only way to pray. Jesus outlines the bare facts of prayer in Matthew, Chapter 6. Yet, He asks us, “When the Son of Man comes, will he find faith on the earth?” Faith involves action and must be mixed with prayer, and exercised to become strong. It is always a good fight. Whatever the outcome of our “good fight of faith” (see 1 Tim. 6:12), we can trust it is God’s plan for us, but only when we have fought it. Fight it and you will witness Jehovah-Shalom entering your world. Sierran Black Bears article from http://www.nps.gov/seki/bearinfo.htm (accessed October, 2005). From this incident, the Corbin and Michaelis families have created a foundation for support of traumatic brain victims called “Ryan’s Reach.” Information can be accessed from the Website: ryansreach.com. Financial, emotional, physical and spiritual needs are addressed. http://aitkenlaw.com/verdicts_settlements/corbin_v_westbrent.html (accessed October, 2005). 5. Merriam-Webster’s Collegiate Dictionary-Eleventh Edition, (Merriam-Webster, Incorporated, Springfield, MA 2003), p.1025. Good morning. I’ve read ahead to the questions after M4. I visualize myself as the egg that is hardened, but that is also responsible for being a BEAR. Most times I feel too overwhelmed to change anything. My heart so wants to be live that El Roi sees me and cares. I’m a grandmother 51 years old, caring for 3 tweets, 4th grade teacher, homeschooling 2 of the 3 and I am physically, emotionally, mentally, financially, and spiritually drained. I study but have memory issues related to a medical diagnosis and have trouble storing it in my heart. I know life happens to everyone. I find myself resentful of having to care for these children and not being financially able to do so. I am a worshipper, not much of a prayer. Just seems I don’t get the answere I need but I love the Lord. But I am thankful for these lessons. I’m so trying to trust. Even as I’m typing this I’m trying to figure how well make it through week. Rent and utilities overdue, no groceries, children need winter clothes, even gas to get to work. And I got paid 4 days ago. Twenty six before I’m paid again. And I tithed. Thank you for your transparency. I was embarrassed to confess christian beliefs when everyone can see my struggle. Thank you for showing me my life is not a walking contradiction. Thank YOU for being transparent. It’s the only way we can help each other. First of all, this book was written in 2008, and it’s taken all these years for me to get it to this point of an on-line eCourse. You are the very first to have responded to my call to action as a subscriber. You are the very first to comment on these blogs. Do you think El Roi sees you and knows exactly where you are at? That He loves you and is ready to pour out His blessings on you and His little ones you are caring for. He is well able, and I know you know that. It’s just hard to see when you are overwhelmed. Allow me to share what God revealed to me this morning as I was praying for you. I saw you trying to turn over about a six-foot golden coin, so very heavy. This coin is the one I mentioned – that has FAITH on one side and FEELINGS on the other. As you look at in on the ground, the FEELINGS side is up and it’s all you can see. The trick is to flip it, right? But, it’s so very heavy. Before you can get it completely turned over, though, you will see the other side. That other side contains Scriptures of faith. The Bible says that faith without works is dead, right? And that’s why you don’t see answers to prayer. Here is an assignment for you to put that faith into action, which will flip that heavy coin without you having to lift a finger and put out any physical effort on your own. It’s all in THE WORD and YOUR WORDS. Take some 3 x 5 cards, or just a sheet of paper, and WRITE THESE OUT. You don’t have to remember anything. Keep these before your eyes. Say them out loud with thanksgiving as you even say, “Lord, you know how I feel, but I choose to look to you and YOU alone. I thank you that….you have met all my needs according to YOUR riches in glory, not dependent upon my paycheck, but on you. Your word says, that if I give, it will be given to me, etc. on and on. Another thing that will help is to write out these verses on the bills as they come in and turn them over to God and thank Him for paying it. P.S. By doing this, Gretta, you are taking care of yourself which will enable you to care for others.